Dennis Monroe Parker was the chief engineer aboard the commercial towing vessel, the USCSS Nostromo. He was on the Nostromo in 2122 when it received a distress signal on LV-426 and they brought an alien organism back onto the ship. Parker was killed by the Xenomorph when he and Lambert were getting supplies for the shuttle. 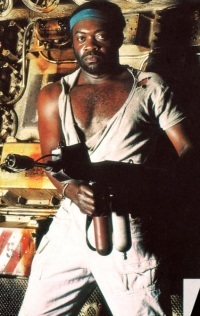 In Alien, he was played by Yaphet Kotto. Before Parker was assigned to the Nostromo, he served with the USCSS Delaney. In the year 2122, the Nostromo’s computer systems woke up the crew because it detected a distress signal coming from a nearby planetoid. Both Parker and Brett were opposed to landing on LV-426, saying they weren’t trained for this but Dallas and Ash pointed out they would lose personal shares in the company, should they not go investigate the distress signal. The crew landed on LV-426, damaging this ship because of the planetoid’s atmosphere. While Dallas, Lambert and Kane went out to find the beacon, Brett and Parker stayed on the ship to work on the ship repairs. An unconscious Kane was brought back by Dallas and Lambert, and Dallas ordered the ship off LV-426 despite Parker not finishing the repairs. When Ash and Dallas were in the medical bay, Parker shouted, asking them why they don’t just put Kane back in stasis for the trip back to Earth, but Ash ignored him. When a Chestburster burst out of Kane and escaped onto the ship, Brett, Ripley and Parker formed one team to find the creature. Brett was attacked by the alien while Parker arrived just in time to see the Xenomorph dragging Brett’s body away. When Dallas went in to the air ducts, Parker rigged a flamethrower for him to use. After Dallas was killed, Parker ignored Lambert’s suggestion to escape on the Narcissus and instead, he was ready to fight this thing here and now. When Ash attacked Ripley, Parker saved her and decapitated Ash with a fire extinguisher. After Ripley deactivated Ash, Parker incinerated him with his flamethrower. The three remaining survivors decided to escape in the shuttle so Parker and Lambert went to the Nostromo’s lower deck to get coolant. The Xenomorph appeared but Parker was unable to use his flamethrower as it would hit Lambert. Parker charged at the alien but it noticed and knocked him to the ground with its tail. It held him down and killed him with a head-bite attack. Brett and Parker were too peas in a pod during their time on the Nostromo, both complaining about their pay and insisting that investigating the distress signal wasn’t part of their pay grade. Parker is very brave though and showed that after Dallas was killed and wanted to kill the alien as soon as possible. He was also somewhat of a hero when he saved Ripley when Ash was attacking her. Parker was named after a major league baseball player called Dave Parker. Parker’s name was originally J.T. Parker on Ridley Scott’s character notes but this was changed to Dennis Monroe Parker by James Cameron for Aliens. Parker appears in the Last Survivor DLC for 2014’s Alien Isolation video game and actor Yaphet Kotto provided his voice and likeness for the game.